I first ran for alderwoman because I love this community. St. Louis has been a wonderful place for me to live and raise a family. I want everyone here to feel that way. We have a lot of work to do as a city and what I bring to my work on the Board of Aldermen is my experience as a neighbor, a mom, and a community advocate. I’ve served as the alderwoman for the 28th Ward since July 2017. What we’ve accomplished during the time I’ve been on the Board has me excited and energized about how much more there still is to do. I’ve been engaged on the issues that impact my neighbors in the 28th Ward the most: responding to the needs of constituents on public safety, development, and neighborhood upkeep; addressing historic district standards and short term rentals; promoting our local businesses and maintaining civic treasures like Forest Park and the MUNY. And on city-wide issues that affect us all — from ward reduction to better governance, from raising environmental standards in our city to a commitment toward racial equity — I’ve been on the front lines fighting to create the city we all want St. Louis to be. I’ve lived in the 28th Ward since 2003, raising my children and serving my community. I first moved to St. Louis in 1997 and then the Central West End in 2003. The CWE is where I bought my first house and started raising my children, and it's where I fell in love with St. Louis. Since 2016, I have lived in the Skinker-DeBaliviere neighborhood where my children have been attending school since 2007. I earned my bachelor’s degree in environmental studies and a law degree from Washington University. Between undergraduate and law school I volunteered in Guatemala and then started a family. As a young woman new to motherhood, I craved community so I sought it out everywhere my stroller could reach. I worked with other parents in the neighborhood to organize playgroups, holiday parties, and discussion panels on educational options. Questions about where to send our kids to school and what to do about crime came up over and over. I made it my mission to greet every young parent I saw in the neighborhood — whether they were getting groceries, standing at the bus stop, or walking sleepy-eyed behind a stroller. A few of us started a nonprofit, Central West End Families and Friends, with the mission of attracting and keeping families in the neighborhood. We helped develop Samuel Kennedy Park, a small parcel of land at the northern edge of the neighborhood for families to gather. I became an ambassador of sorts for the CWE. When St. Louis Kids Magazine wanted to feature seven family-friendly neighborhoods, they put the CWE on the front cover with a picture of my family at Kennedy Park. When the BBC wanted to do a story about the disparity surrounding Delmar, they interviewed me about my experience as a white woman living near the “Delmar Divide”. I’ve walked with local reporters up and down Euclid sharing my enthusiasm for the neighborhood. In my professional life, I have practiced law as a civil rights attorney, representing parents of children with special needs, Medicaid recipients, and victims of discrimination. I then received the opportunity to run a statewide environmental advocacy organization, and, since 2013, I have been the executive director at the Missouri Coalition for the Environment (MCE). I am passionate about the environment because I care about people and believe that everyone, no matter their income, race, or age, should enjoy clean air, water, and open space. I believe in planning for the long-term and, despite whatever obstacles arise, persevering to do what is right for my community. We have a lot of work to do as a city and we have to face head-on issues of racial equity, community safety and social justice while maintaining and improving our extraordinary community. 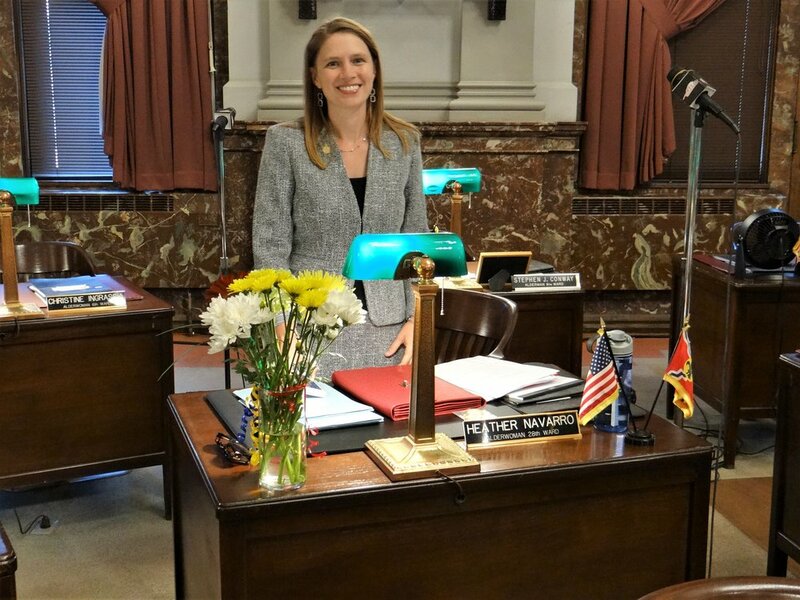 I believe in addressing the underlying threats to the public interest and I bring my experience as an alderwoman, a neighbor, a mom, and a community advocate to work hard for the 28th Ward and the city of St. Louis. First and foremost, I’m here to serve my neighbors and community. I believe in carrying forward the culture established in this ward of attentive and responsive leadership. I work hard to maintain the trajectory of progress that has made this community a wonderful place to live, own a business, and raise a family. To address the day-to-day safety of our community, we need to address the root causes of crime. I want everyone who lives, works, or visits here to feel safe and welcome. To be a safe and welcoming community, we have to embrace our role in the context of the entire city. This means addressing the difficult issues of education, employment, and poverty. We need to go beyond treating symptoms and collaborate with others to create opportunities for youth, confront racial injustice and economic disparity, and address addiction and trauma. Gun violence is tearing apart families and communities while car break-ins and petty theft are driving people out of the city. Safe communities start with strong relationships. My work focuses on connecting neighbors and organizations and building trust between law enforcement and the community. Development is critical. We have to balance the development that drives growth in the city with ample community benefits. I believe in leveraging city resources in a way that lifts up the entire community. Development is important for growth and expanding economic opportunity. When making decisions about zoning or incentives, we should leverage city resources to ensure that economic benefits reach the communities that need them most. The Board is working on a framework for the city that incorporates thoughtful urban planning that includes allocating incentives in proportion to the level of need. As a city and a region, we must confront racial inequity in everything and analyze the impacts of every decision for how it either perpetuates or heals racial injustice. I'm working towards a more unified St. Louis. This begins by further analyzing the role my own privilege has played in division and understanding other perspectives about how racial injustice has been perpetrated throughout the region. We must ask tough questions about how our past and present decisions on everything from zoning to parks and recreation impact racial disparities. I am intentional about crossing virtual and actual racial divides and partnering with individuals and organizations who are creating opportunities for healing and reconciliation. Our region is fractured in many ways. This fracturing has created inefficiencies in government and disparity in basic services and opportunities. In order for collaboration to be successful we have to start by identifying the strengths that the city and county each bring to the table and be intentional about three things: 1) taking care of people in the process, specifically the people who have dedicated their careers to public service, 2) preserving and enhancing citizen engagement and responsive representation, and 3) ensuring that every community benefits from a stronger region. I’ve been working on environmental issues from the time I was a little girl. I’m passionate about the environment because I care about people and believe that everyone, no matter their income, race, or age, should enjoy clean air, water, and open space. I believe in planning for the long-term and, despite the obstacles, think St. Louis can be a leader in enacting policies which address climate change and promote sustainability. of news articles by or about Heather and her work as 28th Ward Alderwoman, and more. All of Heather's email updates are available online. To peruse the archive and see the most recent ones, click on the "read more" button below. For a semi-complete list of news articles referencing Heather and her work as 28th ward alderwoman, click on the “read more” button below. DONATE TO HEATHER’S CAMPAIGN FUND! You can give to “Heather Navarro for the 28th Ward” quickly and securely online through ActBlue.